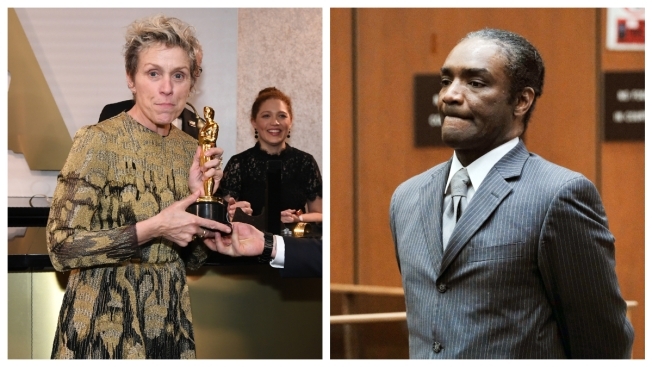 A Los Angeles judge ordered a man accused of stealing Frances McDormand's best actress Oscar statuette to stand trial on a felony grand theft charge. "God is on my side," Bryant was heard saying in court after the ruling. Bryant is due to be arraigned Aug. 8. McDormand won the award for best actress in "Three Billboards Outside Ebbing, Missouri" and lost the statuette after having it engraved at the post-ceremony Governors Ball. Cesario Tio, a film academy worker who was escorting a photographer taking pictures at the ball, said he heard on a walkie-talkie that McDormand's Oscar was missing. He said he later saw a man, who he identified in court as Bryant, walk out of the ball holding a statuette and yelling "We did it! We did it." Tio said neither he nor the photographer recognized the man. The photographer took a picture of Bryant, who told them his statuette was won for best producer on "Get Out," which Tio said he immediately knew wasn't an award. A blown up image from the photographer's camera showed a portion of McDormand's name. Tio said he then grabbed the statuette from Bryant. "He said, 'Hey, I'm holding that for a friend,'" Tio testified. He said Bryant followed him back into the Governors Ball, where Tio handed the statuette off to security and he didn't see Bryant again. Bryant, 47, and his attorney declined comment after the hearing. He remains released on his own recognizance. His attorney, Daniel Brookman, argued in court that Bryant didn't try to hide that he had McDormand's Oscar, and the charge should be dismissed. "There was never any intent to deprive the owner of the property on a permanent basis," Brookman said. The attorney also said McDormand did not want Bryant to be prosecuted and displayed a police detective's report that said the actress "stated she is not desirous of prosecution." Hanasono did not allow the police report to be entered into evidence. McDormand did not attend Wednesday's hearing. Much of the hearing focused on the value of the Oscar statuette, which a lawyer for the academy said cost the organization between $2,300 and $2,500 for it to purchase. The lawyer said the award was actually probably priceless to most winners, and noted that winners could not sell them on the open market or give them away to anyone but their heirs.